Are you in a funk? You’re not alone. I’ve been there, over and over and OVER again. But there’s hope! Every time I have been in a funk, God has helped me get out of it. It has taken cooperation on my part, but He has always set me free. Most of the time, the things we’re upset about are not upsetting to God. He’s a great big Papa who knows all things. He is bigger than all things, and He loves you very much. God wants us to rest, and He takes His command to rest very seriously. The Israelites actually got to wander in the wilderness for 40 years because they WOULD NOT rest. It’s THAT big of a deal. So, present all your burdens, cares, worries, and upsets to God in prayer. Imagine yourself leaving them at His feet, and He will give you rest. Related: I wrote a (very personal and transparent) 5-part series here called “Rest In God, Reach Your Destiny” about how I failed to rest for a long time. God had to administer some tough love to me to get me to start obeying Him in rest. Check it out! The Word of God, ministered to you by the Holy Spirit, will heal you in every way. It will encourage every discouraged heart. It will lift up every downcast soul. It will shed light on every dark situation. It will bring you into all truth, because Jesus is the Truth, and the Holy Spirit is the Spirit of Truth. Only knowing the truth can set us free. So get in the Word if you’re in a funk. Scan through them until you locate one that describes how you feel right at the beginning. Then read it. Keep on reading the next one and the next one and the next one. Pray into each verse as you read. Read until you find freedom, because knowing the truth will set you free. Related: Purchase my mp3 teaching about How To Get More Revelation Than Ever Before if you need help REALLY encountering God in the Word. 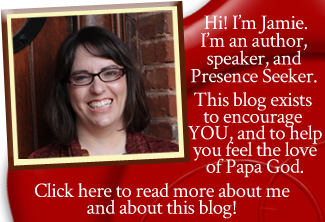 Did you know you can actually command your soul to line up with your spirit–the real you–and make your emotions get steady? It’s true. I discovered this lovely tidbit in the Word one day when I was in a MAJOR funk. I was throwing myself a big pity party, and couldn’t seem to get myself out of it. Then God showed me how to command my soul, and BOOM! Instantly my emotions submitted to my spirit, which is full of the Holy Spirit, and I was out of my funk. I wrote a whole blog post here about how you can get stable by commanding your soul and making it obey you (the real you, your spirit). Hop on over and read that post for more. 4. Thank God for everything you can think of. Start with the big things. I remember how I used to be depressed and suicidal, and God has set me free from depression and thoughts of suicide. I remember that I used to be destined for hell, but one day in 2001, God saved me. I didn’t even know I needed saving, but He reached down and drew me to Himself. Thank You, Father! I remember that, one day at a Joyce Meyer conference in Pensacola, Florida, He baptized me in His Holy Spirit. I’ve never been the same. I remember how I used to be so lonely, but God gave me an amazing husband. I remember how I used to long for covenant friends whom I loved and who really loved me, and God has given me such friends. I remember how I used to have nothing, but God has given me a terrific job, a beautiful home, and an amazing life. As I remember these things, I thank God for them. How can I not? He has done so much for me. But know this, that in the last days perilous times will come: For men will be lovers of themselves, lovers of money, boasters, proud, blasphemers, disobedient to parents, unthankful, unholy” (emphasis mine). Where were you at this time two years ago? Thank God that you’re not there now. What were you doing at this time last year? Thank God that you’re not doing it now. Who has He brought into your life? How has He met you at the point of your need? How has He comforted you when you’ve been lonely? How has He helped you get out of a funk so many times before? God is so faithful. Even if we wander, God remains true. He loves you. He cares for you. He pours out on you blessing after blessing. So please, if you’re in a funk, start thanking Him for everything you can think of. It will help you come to your senses. Prayer is such a huge key to digging yourself out of a funk. You don’t have to go to God and try to sound all spiritual, either. Just tell Him EVERYTHING that’s on your mind–and I do mean everything! Pour out your heart to Him. He knows it all anyway. He loves you, and He wants to hear you tell Him all about it. As you pray, God will bring you into a state of rest as you release your cares to Him. No matter what kind of a funk you may be in, you don’t have to stay there. 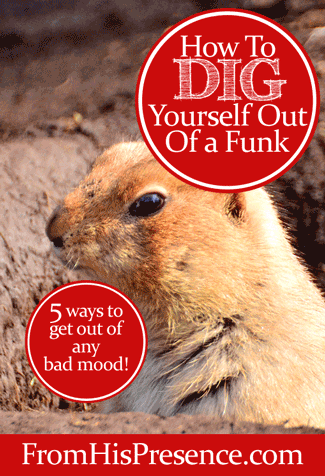 You can dig yourself out of a funk. Yes, you’ll have to cooperate with God to get out of it… but that cooperation is easy. It involves resting, listening, seeking God, and releasing your burdens. It involves speaking to your own soul and thanking God for what He has done for you. God loves you. He sees your heart. He knows where you are. He knows everything about you and He loves you like crazy. So don’t sozzle in your misery! Go ahead and do the 5 things above, and in doing so you will dig yourself out of your funk! Image courtesy of Toshihiro Gamo on Flickr via Creative Commons license. Hi in response to your request to tell you if what happened when i commanded my soul, at first i heard a thought say no, then something changed and i started feeling good and laughed and had a smile on my face. it really works praise jesus, its interesting reading this post because this morning i wasn’t feeling to great and out of my mouth came a chorus to a song, “bless the lord oh my soul and let all that’s within me shout out shout out, have your way, have your way, have your way” unfortunately it didnt have the same effect as commanding my soul according to your post, but still it shows that my spirit was doing what you said even before i knew it was what i needed. thanks for sharing. thank you jesus for sharing with jamie.